Survivors of sexual assault in the US military are often subjected to retaliation for reporting it, Human Rights Watch said. 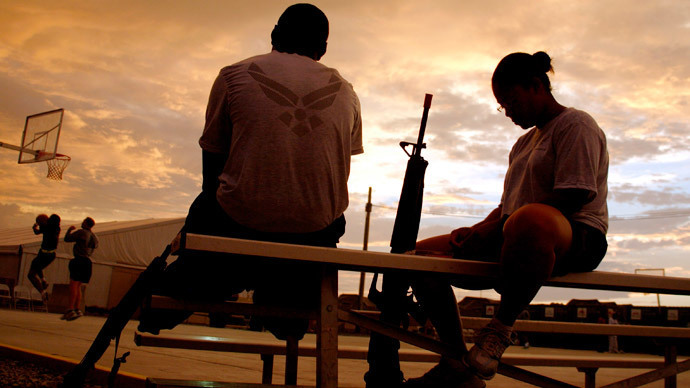 The victimized service members are driven out while their tormentors go unpunished. While the Department of Defense (DoD) is undergoing a reform to address the problem of sexual assault in the ranks, little has been done to eliminate the practice of retaliation, the rights group said in a 113-page report released on Monday. HRW worked with Protect Our Defenders, a group supporting such victims in its 18-month investigation of the issue. The Pentagon’s own numbers say 62 percent of those who report sexual assault later say they experience retaliation. By comparison, only 5 percent of reports led to successful prosecution and conviction in 2014. So a survivor is 12 times likely to be targeted than to see the assailant convicted, HRW said. So far no victim of retaliation saw protection under the Military Whistleblower Protection Act, an exclusive mechanism available for the purpose in the US military. The report says researchers only found two examples of even minor disciplinary action taken against persons who retaliated against a survivor. Fear of retaliation is believed to be a major reason why only an estimated one case of sexual assault in four is ever reported. The forms of retaliation reported to HRW investigators included threats, vandalism, harassment to poor work assignments, loss of promotion opportunities, disciplinary action including discharge, and even criminal charges. The stories came from all branches of the military service. “A certain Sergeant in my platoon had told me he would kill me if we ever went to Afghanistan because ‘friendly fire is a tragic accident that happens,’” said a soldier who reported a sexual assault by a male soldier from another platoon in 2012. Many interviewees said the aftermath of assault, the isolation from peers and damage to their careers stepping from reporting an alleged crime was worse than the assault itself. Adding to the pressure is the fact that military discipline requires that the victims and those retaliating against them often live and work together, making escape from the situation unlikely. One interviewee said she contemplated faking suicide to make way out of the military service and the harassment. The personal harassment was often accompanied with being professionally demeaned by superiors, the report said. Interviewees said after reporting they saw their assignments changed from high-level tasks like intelligence to menial tasks like picking up garbage, or to tasks that took them away from their area of specialty. Their performance evaluations took a downturn after reporting as well. In addition, many survivors said they experienced a string of disciplinary action against them, including harsher punishment like a formal letter of reprimand for minor wrongdoings that would normally be overlooked or end with a verbal warning. A major part of the problem is that the survivors of assault fear punishment for minor misconduct at the time of their attacks, HRW reported. Several of the interviewees were court-martialed or disciplined for actions that only came to light because they reported their assaults. Even if acquitted, any reprimand may be devastating for their promotion or even the ability to remain in the service, it said. The report says military whistleblowers must be given the same degree of legal protection as their civilian counterparts have and that the pervasive problem of retaliation must be taken seriously. The HRW report was released two weeks after Pentagon’s annual report on sexual assault in the US military. The document estimated the number of such crimes at 20,300 in 2014, a 27 percent drop in two years. The group’s report was welcomed by the DoD. "We are very concerned whenever we hear about retaliation associated with reports of sexual assault, and we are open to any information, analysis, insight and partnerships that will help us craft and improve our way forward," said Laura Seal, a Pentagon spokeswoman.